The winter meeting of the Executive Committee/Board of Directors/Charity Trustees was held in London in late January 2012. After meeting and discussing potential individuals for the position of CiCea Treasurer, the Executive/Board of Directors/Charity Trustees nominated Christopher Gifford for he position. Chris was elected to the Executive/Board/Charity and took office on October 1, 2011. His nomination for the position of Treasurer was announced to the membership via email and an electronic virtual confirmation was initiated as had been decided at the AGA meeting in Dublin (June 2011). The balloting was completed in 2011 and the confirmation of Chris Gifford to the post of treasurer was completed in early 2012. Chris was approved by 92.9% of the institutional members and by 89.7% of the individual members. His term in the Office of the Treasurer will run until September 30, 2016. 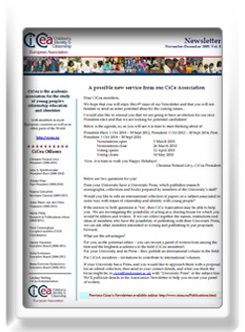 An electronic version of the nineteenth CiCea Newsletter (January - February 2012) was emailed to all members early in February 2012. Association newsletters # 16, 17 and 18 were published and emailed to all members in early August, October and December 2011 respectively. The original meeting venue was set for Vienna but venue scheduling made it necessary to change sites. Thus, the autumn Executive Committee/Board of Directors/Charity Trustees meeting was once again held in Berlin. Among the decisions reached at the meeting was the name of the person nominated for confirmation of Association Treasurer, Christopher Gifford, with electronic membership confirmation to follow. Another decision was the restructuring of institutional rates into three bands 60, 250 and 480€ effective immediately whereas the individual rate restructuring is to take effect for 2012-2013 membership subscriptions. These will be in four bands: 30, 50, 80 and 100€ dependent on salary. The summer Executive Committee/Board of Directors/Charity Trustees meeting was held in Paris. This was the last meeting as a member of the Board for Riitta Korhonen and Anne-Marie Van den Dries. They were genuinely thanked for all their hard work on behalf of the Association. Among the matters discussed was the nomination of a candidate for the position of Association Treasurer to replace Anne-Marie Van den Dries. Several names were put forth and discussed. The virtual election/confirmation was decided to take place after the next Executive Committee meeting. The Associations Annual General Assembly meeting was held in Dublin Ireland on June 10, 2011. The Executive Committee/Board of Directors/Charity Trustee election results were announced: Three hundred and twenty-two votes were cast. The three positions were filled by Marta Fulop, who was re-elected to the post of Scientific and Publications Officer and Christopher (Chris) Gifford and Beata Krywosz-Rynkiewicz who were elected to fill the other two positions on the Board of Directors/Charity Trustees. Among the decisions taken at the meeting was the restructuring of membership fees to cover the cost of the Association journal, with no institutional membership being set at less than 60€. Among the activities approved included a) extending and developing the Association’s membership from other fields of research, b) defining different activities in order to increase the fundamental & applied research visibility of the Association, c) surveying the membership on the types of specific research activities they conduct and/or are involved in related to the Association’s missions and d) promoting the establishment of regional and/or national CiCea affiliates and to support the regional Citizenship Education conferences. The Outstanding Publication Award 2010 was announced. The awardee's were Maria Erikkson and Elisabet Näsman (University of Uppsala, Sweden) for their paper entitled ‘Interviews with Children Exposed to Violence’ (2010). Children & Society. doi: 10.1111/j.1099‐0860.2010.00322.x While the first award for the Outstanding Contribution for the Association’s development and positive visibility was awarded to Alistair Ross (UK). It was also decided a virtual meeting/confirmation would be held in the fall to fill the position of Association Treasurer becoming vacant at the end of Anne-Marie van den Dries term in office (September 30, 2011). Elections were held to elect three (3) members to the Executive for the period October 2011 - September 30th, 2014. Nominations closed on March 31st 2011, and candidates who had met these requirements were included in the voting papers. Voting papers and candidates’ statements were sent electronically to all CiCea Members (Institutional Contacts and Individual Members) on April 11th. Members voted electronically on the papers provided. Voting closed on May 9th 2011. The outcome of the election were announced at the CiCe Association Annual General Assembly in Dublin in June 2011. Further election application process information was available on the CiCea Website. The research grant award 2010 was awarded jointly to Ulla Lundgren (Sweden), Georges Cappelle (Belgium), and Gary Crippin (Turkey) for a study entitled ‘Collaborative Learning Around the World Regarding Global Citizenship Education: Possibilities and Prospects for Practice and Research through Web--‐ Based Social Networking’. An electronic version of the thirteenth CiCea Newsletter (January - February 2011) was emailed to all members early in February 2011. The Board of Directors/Charity Trustees held their autumn meeting in Berlin. This was the first meeting for which Julie Spinthourakis served as President of the Association and Christine Roland-Levy as Past-President. Nanny Hartsmar of Malmö University made use of the University of Patras CiCea Research Centre when she came to Greece for a research and teaching Erasmus mobility. She interviewed faculty and post-graduate students. The Board of Director's/Charity Trustees held their June 17th-18th meeting in Warsaw. This was the last meeting Alistair Ross served as Past-President. At the meeting the Outstanding Publication Awards rules and regulations were discussed and voted upon. The Association's Annual Meeting in Barcelona on May 22nd received the Executive's proposals for new Association activities next year. These include the possibility of research travel grants to help members move about Europe, and annual awards for the best publications by CiCea members. Detailed plans will be announced in the Autumn. As reported at the AGA, the Association has achieved record membership this year - fifteen new members were recruited in Barcelona. We now have over 110 individual members, and over 40 institutional members. President-elect Julia Spinthourakis has set a target of increasing membership in all categories during her tenure. Increasing membership means more member benefits - more travel grants, more research grants. Nominations were opened in February 2010 for presidential candidates. One candidate was put forth. Nanny Hartsmar was confirmed by the membership and will begin her term in office on October 1, 2010 as CiCea President-elect. 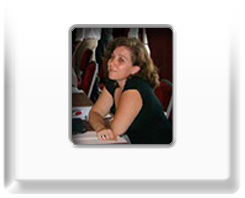 On October 1, 2012 she will assume the office of CiCea President when Julia Spinthourakis will complete her 2 year term as President. The Association has launched eight European Research Centres. Members have the exclusive use of these Centres for individual study/research purposes, or for research group meetings. The Universities providing the Centres make meeting rooms, internet access and library facilities available, and can provide details of possible local hotels, etc. They may also facilitate access to schools and educational institutions for research purposes. For more details, go to the Activities page or directly to the relevant article. Research Centers are to be located in Malmo, Ankara, Patras, Reims, London, Coimbra, Budapest and Olsztyn. Newsletter #6 was published and distributed at the beginning of December 2009. Newsletters #7, 8, 9, 10, 11 and 12 were published and distributed in February, April, June, August, October and December of 2010 respectively. The next issues of our journal will be the first to be printed and published by the academic publishers Intellect. The issue will be launched in July 2010. Members of the Association will continue to receive the Journal, which will aslo be available commercially from Intellect. Ian Davies will continue to act as Editor.